STANTON WARRIORS - FEATURING BOTH DOM & MARK! In the studio, Bristol’s Mark Yardley and Dominic Butler have honed a trademark, un-categorizable sound that is at once all their own, but also utterly indefinable; leading to high-profile releases on XL Records, Fabric, Cheap Thrills and Universal, alongside official remixes for everyone from Daft Punk to MIA and Fatboy Slim. 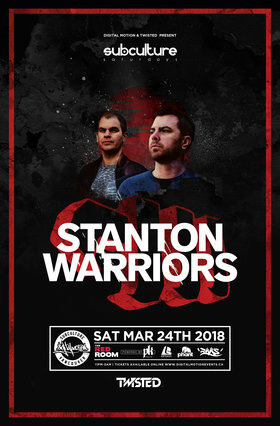 This phenomenal output and remarkable longevity, has ensured the Stanton Warriors legendary status amongst not only their fans, but also their peers, as they remain fresh, original and relevant; obstinately dancing to beat of their own drum and helping to pave the way for new talent with their label. LISTEN TO THIER SET LIVE FROM THE 2017 FRACTAL FOREST! As always, SUBculture is powered by PK SOUND. Hearing protection is advised.